Dr. Jennie was born and raised in South Korea before coming to the states with her family in 1998. She is fluent in both English and Korean. She grew up in Wayne, NJ and received her Bachelors of Art in Cell Biology and Neuroscience at Rutgers University. Dr. Jennie received her D.D.S degree from New York University, College of Dentistry. 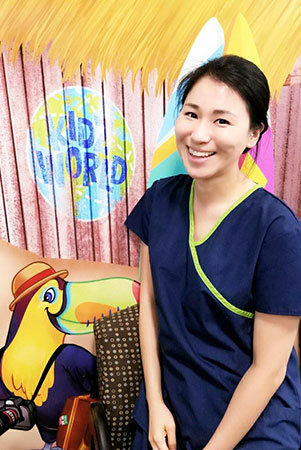 She spent additional 2 years in Rutgers School of Dental Medicine to complete a specialty training in Pediatric Dentistry to pursue her love of helping and working with children. She is a member of NJ Honor’s Society and Omicron Kappa Upsilon (OKU), the National Dental Honor Society where she received a number of awards for her excellence in Academics. During all her studies she also enjoyed and excelled in extracurricular activities such as art and music. Besides being a fabulous pediatric dentist she is a huge animal lover, especially her 4 dogs Angel, Mini, Teddy and Buddy. During her free time, she enjoys traveling to different countries, hiking, Pilates and volunteering at her community garden and animal shelter.